The "cottages” of resort town Newport, RI, grew increasingly lavish during the 19th century, but the one that Alva Vanderbilt unveiled in 1892 made the rest look shabby by comparison. Constructed in secrecy for almost four years and ostensibly a present from her husband, William Kissam Vanderbilt, Marble House did what Alva meant it to do—confirm her position as one of the leading lights of society. Marble House’s bronzed entrance gates weigh at least 10 tons. 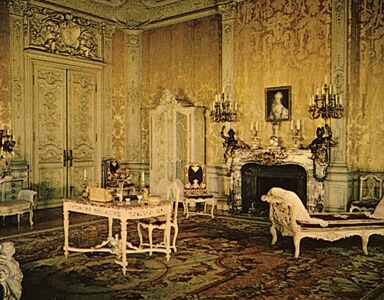 The Gold Room, where guests danced until dawn, put the “gilt” in the Gilded Age. The home consumed more than half a million cubic feet of marble. Alva’s delight in drawing inspiration from famous buildings of old was best expressed by the façade’s quartet of Corinthian columns. They resemble those that support the Temple of the Sun at Heliopolis in Egypt, with one key difference—Alva’s are bigger. Alva knew that any millionaire could commission an opulent house, but few had the taste to create something that was as elegant as it was expensive. Working with architect Richard Morris Hunt, she spent liberally and got her money’s worth. 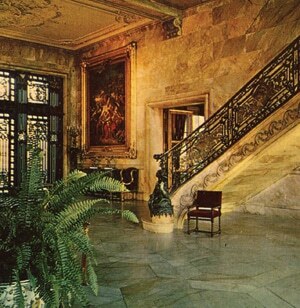 Marble House cost $11 million, an amount comparable to $260 million today. The home is a fitting memorial to Alva’s uniquely strong and unforgettable character. Her indefatigable drive made her the Sir Edmund Hillary of social climbers, planting the flag of the house of Vanderbilt at the summit of Gilded Age society. Her passion for architecture, underwritten by Vanderbilt wealth, set new standards for grandness. She had a bottomless reserve of bravery, which she drew upon when she divorced her philandering Vanderbilt husband in March 1895, a time when divorce was unthinkable. But her bullheadedness propelled her to dark acts that included forcing her only daughter to marry a man she didn’t love. Alva Erskine Smith was born into a well-to-do Southern family in 1853. She savored the privileges of wealth—summers in Newport, schooling in France—but resisted the meek role imposed then on girls. She preferred to play with boys, and when they taunted her, she taunted them back. She also showed a precocious talent for getting what she wanted. In her unpublished memoirs, Alva recalled deciding that she had outgrown the family nursery and should graduate to her own bedroom, but pled her case to her parents and nanny without success. Words having failed her, little Alva switched to deeds: She smashed the china figurines that decorated the nursery and waited for the whipping that would follow. It did, but her caregivers also soon moved her into a bedroom. Alva achieved her goal and felt the pain was worth the price. The early 1870s brought the Smith family to the brink of doom. Mother Phoebe died and father Murray’s business interests faltered, never to recover; he would ultimately fall ill as well. Realizing that no male relatives could step in and provide for her and her sisters, Alva resolved to rescue the family from ruin by marrying well. Consuelo Yznaga, a friend she met during a Newport summer, introduced Alva to William Kissam Vanderbilt, grandson and heir of Cornelius “the Commodore” Vanderbilt, whose shipping and railroad empire generated an unfathomable sum of money. Alva and William married in New York on April 20, 1875. The father of the bride died just two weeks later. The Hunt-designed home she erected at 660 Fifth Avenue in New York was the site of Alva’s second-greatest social triumph. 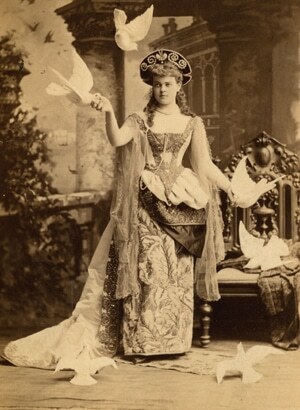 She opened its doors in March 1883 with a dress ball and featured Consuelo Yznaga, who had since married an English noble and become the Viscountess of Mandeville, as the guest of honor. The promise of viewing the interior of one of the most talked-about new mansions, plus the chance to meet a genuine aristocrat, proved irresistible to the cream of society. Alva’s party was sanctified by the presence of Caroline Astor—the Mrs. Astor—whose stubborn refusal to acknowledge the Vanderbilts had held Alva back from the uppermost rung of society. A legend arose that Alva used the ball to checkmate Astor and compel her approval. The story claims that Astor’s daughter, Carrie, was so excited about the party that she and her friends began practicing quadrilles to perform on the big night. Then she received humiliating news: No invitation could be issued until Carrie’s mother respected the prevailing rules of etiquette and paid Alva a social call. Unable to bear her daughter’s disappointment, a fuming Astor steeled herself and ordered her carriage driver to 660 Fifth, calling card in hand. Though Astor did deliver her card before the ball, things probably didn’t play out the way the story claims. The tale captures something important about Alva, however. Even if she didn’t design the party as part of a scheme to trap Astor, she was fully capable of doing so—she had the brains, the guts and the ruthlessness. William’s father, William Henry Vanderbilt, died in 1885, leaving him $50 million, or roughly $1.1 billion by modern standards. Armed with this gargantuan fortune, Alva enlisted Hunt to build a spectacular edifice in Newport next door to Astor’s summer place, Beechwood. Marble House pushed cottage construction to a new level of grandeur. If Alva hadn’t upped the ante with Marble House, her in-laws, Alice and Cornelius Vanderbilt II, may not have demanded such a stunning replacement for their burned-down refuge, The Breakers. They tapped Hunt, Alva’s favorite architect, for the redesign, which took two years and finished in 1895. Its debut must have been a bitter pill for Alva to swallow; in the estimation of many, The Breakers bumped Marble House to second place in the greatest-Newport-cottage-ever sweepstakes. What’s more, Hunt died just before The Breakers was completed, denying Alva the chance to hire him to craft a fantastic response. It was in Newport that Alva executed her most impressive trick: surviving the society version of a near-death experience after divorcing her husband. Finding cause wasn’t an issue; gossip sheets had long alleged that William was unfaithful. The problem Alva posed by citing adultery in her divorce suit was her challenging of an unwritten rule—rich society men assumed that they could have anything they wanted, including women who weren’t their wives. Society ladies were supposed to accept this as part of the marital deal and master the art of looking the other way. The more intensely Alva’s lawyer tried to talk her out of suing, the more she became convinced that he feared other fed-up society wives would follow her lead. She steamed ahead. Toward the end of 1894, William was spotted in Paris with a woman named Nellie Neustretter, furnishing the proof of adultery that Alva needed for her divorce petition. But the fling may have been engineered to cover up an uglier possibility— among the women William was rumored to have seen on the side was Consuelo Yznaga. Alva never discussed the rumors on record, but as with the nursery incident, actions spoke louder than words. That same year, Alva dropped Yznaga from her life. Divorce rendered Alva an outcast. While it was understandable for the Vanderbilts to cut their ties to her, given the torrent of unsavory press that her act rained upon the family (one newspaper deemed the split “the biggest divorce case that America has ever known”), the judgment of her peers was swift and harsh. Alva still received invitations to parties, but only the hostess would deign to talk to her. She claimed that other women, upon seeing her enter the room, would file out in silence. Alva’s strategy to regain her social status relied on preparations that had begun 17 years earlier with the 1877 birth of Consuelo, the eldest of her three children and her sole daughter. From day one, Alva sculpted Consuelo into a catch for the heir to a serious European title, preferably an English duke. Here, Alva’s pro-woman leanings peeked through. England’s social code involved its noblemen in the life of their nation. Its House of Lords, a lawmaking body that is roughly analogous to the Senate in the United States Congress, was then composed entirely of aristocrats. This sense of noblesse oblige permitted upper-class English women some semblance of a public life, unlike their American sisters, who were relegated to perfecting the art of the dinner party. Alva readied Consuelo by schooling her to fluency in French and other languages. She strapped a steel rod to the growing girl’s back to perfect her posture. She stage-managed her daughter’s life, from her outfits to her bedroom furnishings, and when Consuelo had the temerity to venture an opinion of her own, Alva told her, “I don’t ask you to think—I do the thinking, you do as you are told.” Not surprisingly, Alva thought Consuelo deserved no input into the choice of a mate. In August 1895, Alva held a party at Marble House and set her plan in motion. She showcased Sir Charles Richard John Spencer-Churchill, the ninth Duke of Marlborough, as her guest of honor. 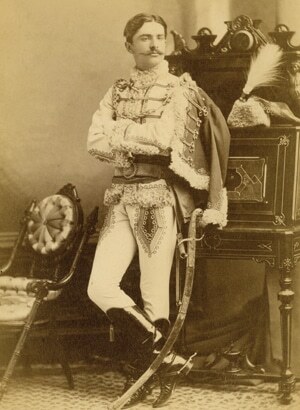 His nickname, “Sunny,” derived from one of his previous titles, Earl of Sunderland, not from his outlook, and he was half a head shorter than Consuelo. Worse, it was glaringly obvious that he was interested in Alva’s daughter only because of her immense wealth. His birthright shackled him to Blenheim Palace, a 320-room, 18th-century estate in Oxfordshire that was the most elephantine of white elephants. The cost of its upkeep had already driven his father, the eighth duke, to wed rich American widow Lilian Hammersley. Sunny grimly resigned himself to marrying for money to keep the lights on. The courting of Sunny and Consuelo was 1895’s closest thing to reality television. Few could look away from the drama of the beautiful teenage heiress, her domineering mother and the sullen nobleman attracted to a fat dowry. But the most gripping episode had already happened in private earlier that summer, when Consuelo tried to stand up to her mother. Mustering her courage, she asserted the right to pick her own husband, and said she chose Winthrop Rutherfurd, a tall, handsome man from an impeccable family. Alva’s rage was fearsome and ludicrous. She accused Rutherfurd of impotence, insanity, gold digging and a few other things before pledging to shoot him if he ran away with Consuelo. Alva carried her drama-queen act into the next day when she remained in her room and let her daughter believe that her defiance had provoked a heart attack. Her confederates told Consuelo that if she didn’t submit, she would stress her mother’s heart again and kill her. The August Marble House ball was a shimmering success, deemed the most beautiful fête ever held in Newport. Sunny, who was staying at Marble House as the family’s guest, greeted the attendees with Alva as they arrived. The festivities lasted until 5 AM; Alva’s position in society was restored. 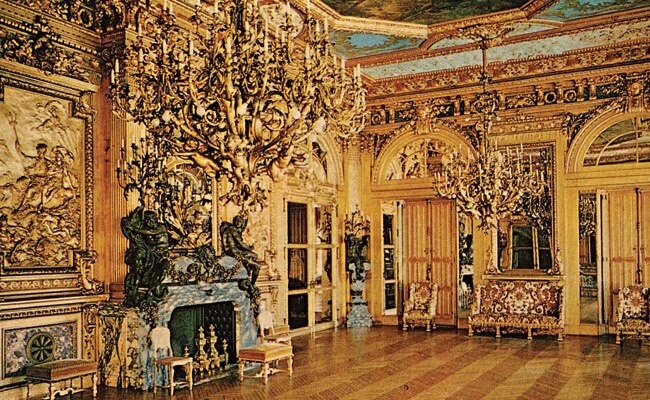 The following month, on the final full day of his stay, the duke proposed to Consuelo in Marble House’s Gothic Room. She gave the only answer she was allowed to give; the ceremony was set for November 6, 1895. Having reclaimed her social status, Alva turned around and married Oliver Hazard Perry Belmont two months after wedding her daughter to the duke. Belmont was a Newport friend who had accompanied her and William on several cruises aboard the Vanderbilt yacht. Unlike his glorious relatives, the naval hero Oliver Hazard Perry and Commodore Matthew Perry, the man who opened Japan to Western trade, Belmont was content to enjoy the world rather than change it. With Belmont by her side, Alva was satisfied and might have spent the rest of her life drifting along happily with him had he not died of peritonitis in 1908. Widow Alva soon found something to occupy her time, though: the women’s suffrage movement. Never good at taking orders from others, she founded the Political Equality Association in 1909, a catch-all vehicle for her suffrage interests. Later, she involved herself in another organization that she renamed the National Woman’s Party. (It still exists, but now serves as an educational organization and an archive.) She admired Emmeline Pankhurst, an Englishwoman regarded as an extreme suffragette, and sponsored her 1913 American lecture tour. Alva hosted suffrage conferences at Marble House and staged fundraisers on its grounds. Its Chinese Tea House, added to Marble House’s backyard in 1913, united her love of architecture and women’s rights. She built it for schmoozing potential donors but declined to mar its interior with tea-brewing facilities. Instead, she employed a miniature train to ferry crockery and refreshments between the teahouse and the kitchen; when teatime was over, the tracks were dismantled and stored. She leveraged her image as a society matron and encouraged suffragettes to pressure President Wilson to support an amendment to the Constitution that would grant women the vote, a goal that was achieved in 1920. If Alva could see the present, she would be mightily annoyed that few remember her work for women’s rights, but would take pleasure in the survival of Marble House. Toward the end of her life, she sold it for the bargain price of $100,000 to a family who intended to keep it mostly intact. 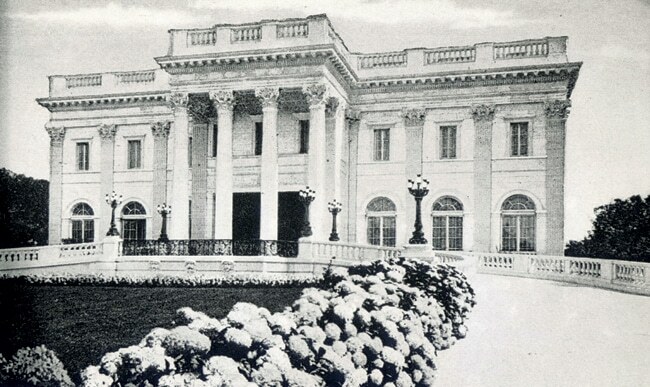 Today, Marble House is the only one of her mansions that still exists. It now belongs to the Preservation Society of Newport County, which welcomes 160,000 annual visitors, who pay a $14 admission price to wander through its rooms, as awestruck as the society hopefuls whom Alva invited to cross her threshold more than a century ago.